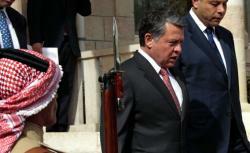 Jordan’s King Abdullah interviewed: The Arab Spring “is a disaster” for Israel. An interview with Jordan’s King Abdullah about the chaos in Syria, and his view that the Arab Spring is a “disaster” for Israel. Photograph by Khalil Mazraawi/AFP/Getty Images. During the World Economic Forum he hosted at the Dead Sea over the weekend, Jordan’s King Abdullah spoke with Lally Weymouth. Q. How do you see Egypt’s future? A. I went to Egypt after visiting the U.S. in May. I had a message from the administration for General Tantawi [the head of Egypt’s military council]. Q. How did your visit to Egypt go? A. With Tantawi—fantastic. We had a very good meeting. I think people were concerned as to how active the army was going to be in providing leadership. And the army had their concerns that if they stuck their neck out too far, they would be penalized. Q. I think it is astounding that Tantawi did not take President Obama’s call for hours the night the Israelis were trapped in their embassy in Egypt. What did you think of that? A. The feeling I got from the Egyptian leadership is that if they stick their necks out, they will just get lambasted like Mubarak did. So I think they are playing safe by just keeping their heads down, which I think creates more questions and sometimes allows things to get out of control. They have seen what happened to Mubarak, and Tantawi thinks there is too much pressure on him. A. No, from the West. Q. They saw that Mubarak was sacrificed quickly and that scared them? A. Exactly. So they are being very cautious in the decisions they are taking. Q. Do you and other leaders in this area believe you cannot rely on the U.S.? A. I think everybody is wary of dealing with the West. Wikileaks didn’t help confidence with American administrations because of conversations made public so easily. Again, looking at how quickly people turned their backs on Mubarak, I would say that most people are going to try and go their own way. I think there is going to be less coordination with the West and therefore a chance of more misunderstandings. Egypt is trying to develop its own way of moving forward. A. I think two things make Jordan stand out. One is that we reached out to everybody and got a national dialogue committee. The other thing that made a major impact is that we have had demonstrations for the past 11 months but only one person has died of a heart attack, as a bystander. Nobody has been killed. It was a decision taken day one that we disarmed all our police. In other countries, police that didn’t know how to deal with citizens: Their solution was to pull out their guns and shoot. Q. Do you think President Bashir al-Assad of Syria can last? Reportedly, some army defectors are coming into Jordan. A. We have had very limited defectors—20 to 50. His late majesty and I have the same policy of non-interference in other countries’ internal issues. We are prepared to accept refugees. There have been some civilians who have come over here but most of the refugees went up to Turkey. We have been very careful to keep all channels of communication open with the Syrians. Q. Does that mean you have talked to President Assad? A. I spoke to Bashar al-Assad twice in the springtime. I sent the Chief of the Royal Court twice to go see him. The conversation was that here in Jordan we are reaching out to people, we are having a national dialogue committee and we would be more than happy to talk and exchange our experiences. Basically, they were not interested in listening to our advice. They basically told us that there are a bunch of thugs in Syria and they had everything under control. A couple of times I have felt that I should reach out to him but I really don’t know what to say. I think he does have reform in his soul, but I don’t think that type of regime allows for any potential reformist. From the times I have met him—and I am quite close to him—I do believe he has it in him, but the system doesn’t work that way. Q. People are asking about an alternative to President Assad. Can another Alawite or a Sunni overthrow him? How do you see this playing out? A. I think nobody has an answer to Syria. It is the big question. I think everybody is confused. The regime seems to be quite strong. I think you are going to see continued violence for the time being. Q. Do you think they can win? In the West, you hear over and over that Assad’s days are numbered; it’s just a matter of time. A. My view is when you use violence on your people, that never ends well. But anybody would be challenged to say if that’s six months, six years, or 16 years. Q. What is your assessment of Libya? A. It took everybody by surprise. We were committed to the transitional council from Day One. We had our F-16s flying out of Italy and we had our men on the ground in Benghazi. Q. So you think the death of Colonel Gaddafi is a good thing? A. There is an old saying that peace is going to be much harder than war. I think the challenge for Libya now is how to make this transition peacefully. Q. I heard that Hamas leader Khalid Mashal is coming to Jordan, is that true? A. If he comes here, it is part of looking at Palestinian reconciliation. It is not confirmed yet but there are discussions. Khalid Mashal visits every single Arab country on a regular basis except for Jordan. Because of the loss of Egypt’s political leadership, the rest of us are having to step up. On the Israeli-Palestinian issue, Jordan’s relationship with the Palestinians has had to take a step forward. Q. You support Palestinian President Mahmoud Abbas’ request for U.N. membership? A. Yes, we do. It is out of desperation and frustration that they are going to the U.N. I think part of the problem is that in the U.S., you have your other priorities. A. Your elections. I think the administration would be very wary to step out front without guarantees on the Israeli-Palestinian process, which is a shame because it is desperately needed now. Some Israelis are saying the Arab Spring is a better thing for Israel. I think it is actually a worse thing. Q. It is a disaster for Israel, isn’t it? A. It is a disaster. You have seen what has happened in Egypt; you have seen Turkey. We are actually the last man standing with our relationship with Israel. That puts tremendous pressure on Jordan. Q. The Israelis are worried the Egyptians will break the treaty. A. That is a very, very strong possibility. If I were in Israel, I would be very concerned when I look at the regional map. Q. Do you intend to support Jordan’s treaty with Israel? A. We have a peace treaty with Israel and we will continue to do so because it helps both parties. We have shown this many times. And more importantly it allows us a strong seat of mediation between the Israelis and Palestinians vis à vis the peace process. Q. A lot of Israelis think your recent statements have been hostile. A. I don’t know if they are hostile. What I am saying is they are missing an opportunity here and I am very concerned. This is the most frustrated I have ever been about the peace process. I think a lot of us have come to the conclusion that this particular [Israeli] government is not interested in a two-state solution. I always look at the glass half full and I’m looking at it half empty for the first time and so the words that are coming out of my mouth are more out of frustration and depression that I think the Israelis are missing a golden opportunity to solve their problem today as opposed to kicking it down the road, when I think the alternatives will be more limited. Q. What did you think of Israel Prime Minister Benjamin Netanyahu’s deal with Hamas to release an Israeli soldier? How does it affect the region? A. It is politics at the end of the day. The Shalit deal has been on and off the table with consecutive Israeli governments. Q. It was strange for Israel to be negotiating with Hamas. Will there be an impact in the larger sense? A. I think all of us have been asking each other: What is the Israeli government’s true intention right now? Since I am not convinced there is an interest in a two-state solution, the question I am asking is: What is Plan B? Q. You just appointed a new prime minister. A. Yes, for the past six months we have listened to what people want: constitutional changes, new election laws, an independent commission, a constitutional court, etc. There are a total of 30 laws and amendments that we have to ratify just to get to national elections next year. The new prime minister, Awn Shawkat Al-Khasawneh, has got an impeccable record. He is the ideal person to get us to national elections as quickly as possible. Q. If you look five years down the line, do you see yourself relinquishing some power to the parliament? A. Probably sooner. We haven’t shut any doors on relinquishing power. My mission is as quickly as possible to get Jordan to have a prime minister elected from a political party. …We need to create new political parties based on programs. If we have elections next year, we will have a new parliament but we won’t have political parties. Q. You will still appoint the Senate? A. There are two options. If there is a new parliament next year, do I look at blocs inside the new parliament and pick a strong bloc and say OK, you pick a new government? Or do I give the new political parties the next four years of parliament to establish [themselves] so that five years from now you have an elected government? I think five years is too long. I think we are facing the same challenges as everyone in the West. The Arab Spring didn’t start because of politics; it started because of economics—poverty and unemployment. You cannot move political reform without economic reform. Q. Once you have people rioting in the streets, how do you get foreign direct investment? A. That’s the problem. That’s the challenge we have here. What keeps me up at night is not political reform because I am clear on where we are going. What keeps me up at night is the economic situation because if people are going to get back on the streets, it is because of economic challenges, not political. Q. But you made a deal with the Saudis? A. The Saudis have come through very strongly this year but our oil bill is something like 40 percent of the budget because we are an importer. Q. And that is because you are having problems getting natural gas from Egypt? A. We are having problems because the gas pipeline keeps getting blown up in Egypt and because of the price of oil. Q. There are reports that over the next five years if you join the GCC [Gulf Cooperation Council], you will receive additional aid. A. There is going to be a package hopefully of at least a billion a year from the GCC. But at today’s prices, it just covers our energy bill. It won’t give us money for growth.